Join fellow AMWA members for a casual evening of networking at Diskin Cider in Nashville, TN. See you there! Please join the Southeast Chapter for a presentation by Yasmine S. Ali, MD, MSCI, FACC, FACP entitled “Lies, More Lies and Statistics” about falsified journal articles. The presentation will be followed by discussion and networking. RSVP here by March 30. Walk-ins welcome! Can’t make the live event? Dr. Ali’s pesentation will be livecast via Periscope (host: @amwasoutheast) and will be recorded for viewing after the session. The AMWA-Southeast Chapter will be hosting a holiday party at the Germantown Cafe in Nashville, Tennessee on Monday, December 4, 2017, at 5:30 pm. Click here to RSVP by no later than Friday, December 1, 2017. We look forward to seeing you there! Want to see more networking in your local area? Check out this blog post for information on how to plan an event. 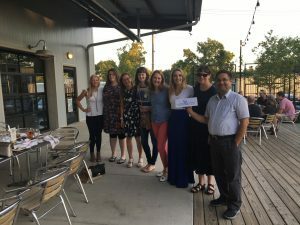 A networking happy hour was held on June 30, 2016 in Nashville, TN. The event was held at M.L. Rose Craft Burgers and Beer (West Nashville location), a popular casual gathering spot with a spacious outdoor patio that is very accommodating to large groups. An invite was sent to all current AMWA Southeast members using Evite; the invite was subsequently shared with contacts at Vanderbilt University, who posted information about the event on the Biomedical Research Education and Training Career Development website to capture potential new members. Ten people attended the networking event (8 members, 2 non-members). The chapter provided appetizers.